A complete Meridian surround system. Great entry system into the extremely high end Meridian equipment and compatibile with all DSP model speakers if you wish to upgrade in the future. Someone is going to get an amazing deal here! The pure analog 850 avoids all the sonic problems associated with switching amplifiers, such as noise radiation, dynamic limiting, and distortion. Boulder’s proven linear circuit design allows you to hear your music exactly as it was recorded. The 7B-SST2 single-channel amplifier employs a balanced-output design that reduces THD and IMD to unprecedented low values (typically 0.001% or less) . With a low noise floor (typically below -118dB) and excellent signal tracking characteristics (slew rate of 120 Volts per microsecond), the 7B-SST2 monoblock assures a new degree of transparency, musicality, and ease of listening. Capable of delivering 900 Watts continuously into 4 Ohms, and with tremendous power reserves, the 7B-SST2 offers virtually perfect freedom from overload on any type of speaker or music. The 7B SST single-channel amplifier employs a balanced-output design that reduces THD and IMD to unprecedented low values (typically 0.001% or less) . With a low noise floor (typically below -118dB) and excellent signal tracking characteristics (slew rate of 120 Volts per microsecond), the 7B SST monoblock assures a new degree of transparency, musicality, and ease of listening. Capable of delivering 900 Watts continuously into 4 Ohms, and with tremendous power reserves, the 7B SST offers virtually perfect freedom from overload on any type of speaker or music. The Krell Theater Amplifier Standard comprises five identical channels in a single chassis, providing prodigious output capability to drive any home theater speaker array to lifelike levels… with unmatched Krell sonic excellence. MSRP: $7500, BlueBook: $4420, 100 lbs. The MHT200 combines the flexibility of a premium home theater processor and the power of eight individual amplifiers all in a single component. With switching provided for Component Video, S-Video and Composite Video and eight analog and six digital audio inputs, you won’t outgrow the MHT200 anytime soon! The elegant Krellcoat exterior hides the powerhouse that resides within this amplifier. Refined reproduction and overwhelming power defines the KAV-3250. Utilizing technology developed in the Krell Full Power Balanced amplifiers including oversized power supplies, Krell Current Mode circuitry, and balanced signal paths, this amplifier is ideal for use in stereo music and movie soundtrack reproduction. Simply elegant, the refined brushed aluminum Krellcoat finish only hints at the exhilarating performance that lurks beneath the exterior of the Krell Showcase Multichannel Amplifier. Every aspect, from sonic performance and power delivery to style and upgradability, functions in seamless harmony. The Showcase amplifiers are solidly based on the same legendary Krell technologies found in any of its top-of-the-line-siblings. The Meridian G57 is a solid, reliable, 2-channel unit, delivering a powerful 200W continuous mean power per channel into 8 ohms, or up to a full kilowatt bridged into 4 ohms. Conservatively rated 9/10, faceplate in mint condition! Only 1.5 years old. 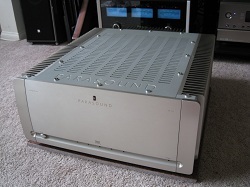 Very sweet and powerful amplifier. Now you can take advantage of traditional McIntosh standards of excellence in the MC-202 power amplifier. Two 200 watt high current output channels will drive any high quality loudspeaker system to its ultimate performance. The MC-202 reproduction is sonically transparent and absolutely accurate. The McIntosh Sound is "The Sound of Music Itself." The Meridian G56 is a compact, 2-channel unit with dual-mono construction, delivering a solid 100W continuous mean power per channel into 8 ohms and suitable for even the most difficult loads. This beast is extremely powerful while still retaining the smooth, musical sound that Classé is famous for. The Proceed AMP-3 is a true multiple monaural design. Each audio channel has its own dedicated power supply and both balanced XLR and single ended RCA inputs. Get that Levinson sound without the Levinson price! The Proceed AMP-2 is a true multiple monaural design. Each audio channel has its own dedicated power supply and both balanced XLR and single ended RCA inputs. Get that Levinson sound without the Levinson price! Very versitile, great for any type of passive subwoofer. Includes original box, packaging and power cord. 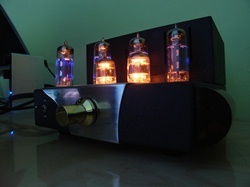 The C2200, which utilizes vacuum tubes to provide all signal amplification, delivers an unsurpassed sonic experience. Unlike a simple rehash of yesterday’s news, the C2200 is an entirely new design that combines the benefits of advanced technology with classic vacuum tube audio performance. Unaffected by amplifier type—tube or solid state—the C2200 will enhance the performance of any system while providing a host of sophisticated operational features. The MX135 has the performance you expect from McIntosh with a new level of flexibility, unmatched in the industry. All the latest technology in digital processing is meticulously designed into the MX119, including Dolby Digital EX, Pro Logic IIx, DTS-ES and NEO:6 which allows the listening of stereo recordings through the full compliment of theater speakers for greater realism. For audio purists, select the Stereo Mode of operation for true analog enjoyment of legacy two channel software including a high performance built-in Phono Preamplifier. The AV8 Preamp Processor is designed to be the center of a high quality home entertainment system. It offers excellent levels of Dolby Digital, Dolby Pro Logic II and DTS decoding with THX post processing from twin Crystal Semiconductor DSP chips. Once again, Integra has pulled out all the stops to deliver a state-of-the-art pre-pro ready to handle all your favorite entertainment sources. Everything from distributed audio to customizable A/V calibration is handled with total finesse. The AV-9 is a fantastic processor THX Ultra2 certified with outstanding analog output. The AV-9 has HDMI Video pass through, 7.1 analog inputs and outputs, digital coax, and optical inputs. It is particularly well known for its high quality 2-channel, and multi-channel analog bypass. This one also happens to come with the phono option. The AVP700 draws heavily on the design work of the world-renowned FMJ AV8 processor. World-class audio processing within the AVP700 delivers a sound quality that will enthrall even the most discerning listeners regardless of the source material or decoding mode required. The C712 System Control Center is simple, yet elegant. There are many useful features to enhance your listening enjoyment. There are seven pairs of high level inputs to accommodate the traditional program sources as well as the most recent new sources. A PHONO input is also provided for a record player with a magnetic phono cartridge. If the PHONO is not used, the AUX input can accommodate another high-level program source. Meridian has combined the latest techniques in high-precision analogue electronics and digital signal processing with a careful analysis of all types of recorded music. The result is a system that produces impressively realistic and exciting reproduction of music and cinema sound with support for all the current two-channel and multi-channel audio formats. As a stand-alone preamp, the DC-1 performs exceptionally. Whether you want to play your stereo recordings with or without DSP environmental enhancements, you'll appreciate the overall sound quality of the DC-1. Very sweet sounding preamp, great for those of us who don't have a phono input on the pre/pro's. Works with MM and MC cartridges. Floor-standing design with a two in one cabinet construction, which reduces sound diffraction between the bass and midrange. Nautilus™ treble unit, Matrix™ cabinet and Flowport™ bass tube. The Nautilus 803 cabinet is made up of layers of ply. The graceful curves of the cabinet are skillfully moulded layer by layer which helps to eliminate the unwanted resonances caused by flexing of flat and square cabinet walls. Conservatively rated 8/10. KEF Reference 203 loudspeakers with matching Reference 202c in beautiful maple real wood veneers. The Reference 203 shares all the technical virtuosity of the 207 and 205, only on a slightly smaller scale. The curved section cabinets are massively braced to eliminate box colorations, and the open chassis design with vented cones eliminates any trapped air noise. Magnetically shielded like the rest of the range, the 203 combines heavyweight muscle with intricate delicacy right across the frequency range. Stereo imaging is superb, the detailing immaculate and response so fluid, you could almost drink it. The recommended center speaker to partner Reference models 203 and 201, the 202c delivers all the listening benefits of the latest Reference series technology. Pinpointing screen dialogue with great accuracy within the sound stage – and when flanked by a pair of KEF’s 165mm (6 1/2") ultra low distortion bass drivers, the combined effect is to immerse the viewer in a detailed soundscape that’s as lucid as it is involving. Great entry into the extremely high end Meridian equipment, as rears for a DSP5200+ system, or as a standalone two channel system. The CS2.4 is the result of THIEL's more than 25 years of extensive experience in designing high performance loudspeakers for home music and video sound systems. Since 1977, THIEL's innovative engineering has led to significant sonic improvements in each new model, resulting in speakers with the most outstanding performance in their class. Great entry into the extremely high end Meridian equipment. Compatible with all late model Meridian preamps. Matches up nicely with DSP3100, DSP5200 or DSP7200 speakers. 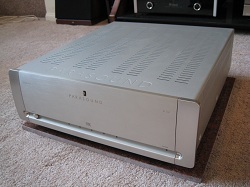 Digital Drive DSP-based subwoofers are the finest subwoofers ever made by Velodyne. And that's saying a lot. They embody all of Velodyne's industry-leading knowledge and experience in low frequency technology. Velodyne pioneered the use of Digital Signal Processing (DSP) for subwoofers. This technology provides incredibly accurate, reliable, and feature-laden performance. The 3-way CS2.3 incorporates many of the advanced driver, enclosure, and crossover design principles used in larger and more expensive THIEL models, but does so at a lower price and in a moderately sized cabinet. The CS2.3 employs a 1-inch metal dome tweeter coaxially mounted with a 3.5-inch midrange driver, and an 8-inch metal diaphragm woofer, with a passive radiator. 4-way design with dual 6.5" LF drivers, Uni-Q (midrange and tweeter) and Reference Series HyperTweeter give them crystal clear highs, deep lows and amazing imaging and detail. We challenge you to find a subwoofer that is as articulate, lightening fast or hits the lower frequencies with this precision and detail. And at this price point… forget about it. The Tone is a dynamic, full range, crossover-less design in a sealed enclosure. It utilizes Zu's proprietary 10.3-inch full-range driver and tweeter, with a high-pass filter at 12kHz to achieve a bandwidth of 50-60Hz (it varies depending upon the room) to 25kHz. At 12 ohms nominal impedance (dropping to a minimum of 8.5 at 20Hz), the Tone is a highly efficient 101dB@1 watt/1 meter, which should allow them to mate very well with low-powered amplifiers. Very deep and clean lows, sweet and smooth highs. Small yet extremely versatile. Unassuming visually, yet a sonic force. The SCS4 is a 2-way loudspeaker that performs equally well as an excellent full-range stereo pair, surround-sound, or center-channel speaker. It's coaxially-mounted drivers and aluminum baffle contibute to the SCS4's outstanding fidelity, making it as comfortable in demanding music systems as it is playing movie soundtracks or background music. The True Subwoofer Super Junior is another example of why you should never judge a book by its cover. 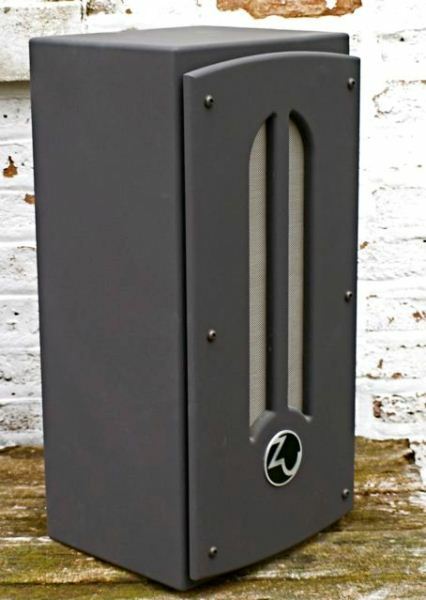 At just 9” tall, its 1500W internal amplifier puts out an unbelievable 108dB of the best sounding bass in the business. And, its small size also makes it the ideal solution for smaller home theater systems where multiple subwoofers are desired for smoother room response. Like its heftier siblings, the True Sub Super Junior features 5th- Generation High Back-emf technology and a Tracking Downconverter™ power supply, both Sunfire developed and both there to provide the highest output, coolest operation and most sensational experience possible. The SC-8 is the smallest of the SC Series. Its small size, shallow depth and flush rear panel allow it to fit anywhere. 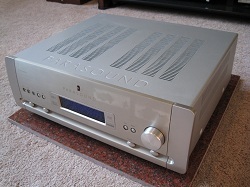 It connects to the Velodyne SC-1250 amplifier (or other power amplifier) giving it maximum placement flexibility. The SC-8 can be placed facing downward, for venting through the kick plate of a custom cabinet. No other subwoofers offer the compact, powerful, low-distortion bass of the SC Series! The new MVP881 BR Universal A/V Player from McIntosh is a high performance Blu-ray player with web-enabled features that excels at playing SACD and DVD Audio discs as well as standard CD’s and DVD’s. The MVP881 BR features custom fabricated steel and aluminum casework with unique, compartmentalized sub structures that inhibit resonance while shielding sensitive audio circuits. Also noteworthy is an all-metal disc mechanism; set in a heavy, damped base, this disc mechanism is quiet running, highly accurate and features a cast-aluminum disc tray. MVP881 is the right product for music lovers. The MVP861 plays them all: CD’s, SACD’s, DVD’s, DVD-Audio, CD-R, and CD-RW discs. Three 192kHz/24 bit Digital-to-Analog converters deliver the highest resolution sound these formats can deliver. The Technics SL-1200MK2's heavy-duty design, vibration-resistant construction, and mechanical precision make a lot of what those early DJs did possible. This deck was the first to feature a Direct Drive motor, quartz movement for total accuracy, adjustable tone arm weights, anti-skate control, a pop-up target light and a sliding pitch control. With each new improvement, as form follows function, the Technics turntable has become a thing of beauty. 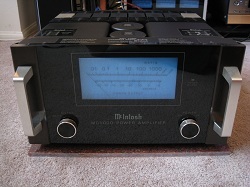 Classic Denon TU-460 tuner in excellent condition, performs flawlessly. Includes FM and AM antennas. Component level AC cleaning and protection in a compact and affordable form. The PS Audio Quintet Power Center saves your system by protecting it from deadly power surges. It saves your eyes & ears from the effects of dirty electricity by offering outstanding AC Power filtering with Nano-Crystalline port isolation. It saves space by being 75% smaller than The Power Plant Premier or Quintessence. And it saves you the headache of trying to find a power filter you can trust. Most importantly: it saves you money. The Quintet is one of the best values in AC power conditioning ever. 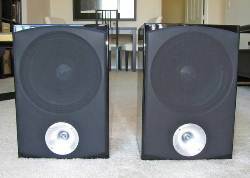 1 pair of 8' Transparent Audio The Wave 100 speaker wire with spade terminators. The Wave 100 delivers a full measure of naturalness and musical colour on all types of music. - Features Neutrik Gold Male to Female XLR connectors. - Low 13 pF/ft capacitance. - Also works for digital AES/EBU. •	UL CL3-Rated for in-wall use. •	Magnetic Flux Tube® for smooth, extended frequency response. •	MultiTwist™ construction for lower noise floor. •	PEX™ dielectric for improved reproduction of harmonic structure and inner detail. •	Time Correct® multiple gauge wire networks for greater clarity. 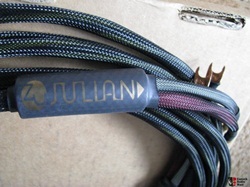 1 pair of 12' Zu Audio Julian speaker wire with spade terminators on each end. See our current sales on Audiogon.